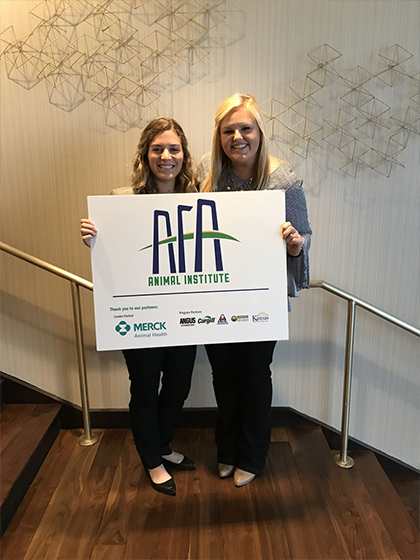 Three Cal Poly students attended the Agriculture Future of America (AFA) Animal Institute from April 8 to 10 in Kansas City, Missouri. Dairy science junior Elise Regusci, animal science senior Morgan Wonderly and agribusiness sophomore Shane Stubblefi eld attended the institute along with nearly 100 students from colleges across the country with an interest in animal health. Students visited different businesses based in the Kansas City Animal Health Corridor, including companies specializing in animal health, nutrition and marketing, among others. Other opportunities for students to network with industry professionals included an industry panel and career roundtable. Will Kraemer, 21, a bioresource and agricultural engineering junior and president of the Cal Poly Logging Team, topped competitors from a dozen western colleges and universities at the highly competitive Stihl qualifi er in March. 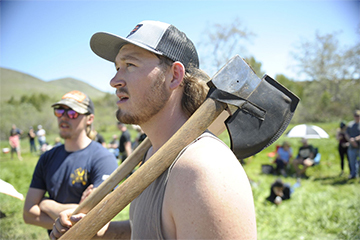 The collegiate lumberjacks were the best all-around competitors from each of a dozen teams attending the three-day Association of Western Forestry Clubs (AWFC) Logging Conclave hosted by Cal Poly. The competition is the largest collegiate timber sports competition west of the Mississippi. In the Stihl qualifi er, collegiate athletes competed in four disciplines: standing and underhand block chops with an axe, single buck with a cross-cut saw and stock saw, a speed-event done with a chainsaw. Kraemer won three and took second in the underhand chop. He will join the winners of four other regional qualifi ers (as well as three wild card selections) from campuses throughout the U.S. when the best lumberjack athletes — collegiate and professional — in the country return to Milwaukee from July 27 to 29 to thrill fans with amazing athletic performances in the Stihl TimberSports Series Championships. The event draws some 15,000 fans. The competition will air on ABC in October, with re-airs on ESPN2. 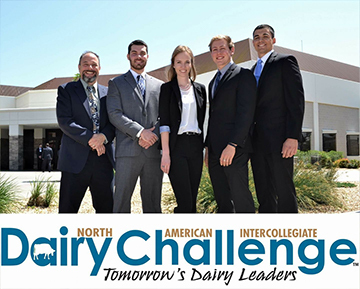 The Cal Poly Dairy Challenge Team earned fi rst place at the 17th annual North American Intercollegiate Dairy Challenge, held April 12-14 in Visalia, California. The win marks the fourth time in fi ve years that Cal Poly has won the Dairy Challenge Platinum Award. The students assessed all aspects of a working dairy farm and developed a farm analysis that included a list of recommendations related to facilities, nutrition, fi nancials, reproduction and animal health. The Cal Poly team ranked fi rst in its division among eight teams. In all, 235 students from 28 states representing the top animal science and dairy programs in the U.S. and Canada competed at the event. The Cal Poly team members on the winning team were: Anthony Echeverria, Amber LaSalle, Matt Ruby, and Tony Lopes. The team was coached by Assistant Professor David Vagnoni, dairy science Lecturer Rich Silacci, and Assistant Professor Julie Huzzey. Students Hannah Neer, Elisabeth Regusci and Tate Nelson also competed at the event. 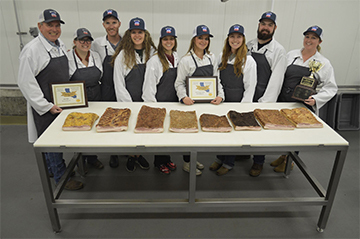 The Cal Poly Meats team brought home the Norm Eggen Championship Cup at the California Association of Meat Processors’ annual Cured Meats Competition, held Feb. 23-25 at UC Davis. Students competed in the collegiate class of 25 entries including UC Davis, Chico State and Fresno State. The award is named for former Cal Poly meats lecturer Norm Eggen, who taught in the 1970s and ’80s. 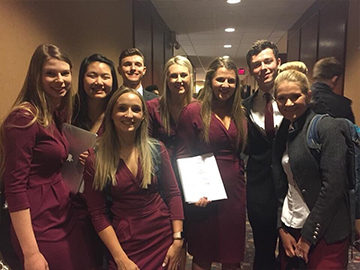 Cal Poly students showcased fl avor-coated bacons, with the team developing, processing and producing the product from concept to completion. Coached by Jim Douglass, manager of Cal Poly’s J and G Lau Family Meat Processing Center, the Cal Poly Meats Team was comprised of eight students: animal science senior Veronica Staggs; animal science junior Connor Smith; graduate student Lane Koontz; animal science junior Kira Olson; animal science senior Catie Field; bioresource and agricultural engineering senior Toni DeMatteo; agricultural business senior Beaujena DeSilva; and graduate student Morgan Metheny. Staggs also earned the Grand Champion Award for her maple bourbon pecan bacon. Forestry and natural resources senior Braden Povah will travel to Itagui, Brazil, in August to compete with the U.S. team in the International Soil Judging Contest. Povah’s nomination to the team follows multiple accomplishments made by the Cal Poly Soil Judging Team in recent months. The team took fi rst place overall and won all fi ve of the top individual performance awards at the Region 6 Collegiate Soil Judging Contest, hosted by Chico State at Butte College, in Oroville, California in March. 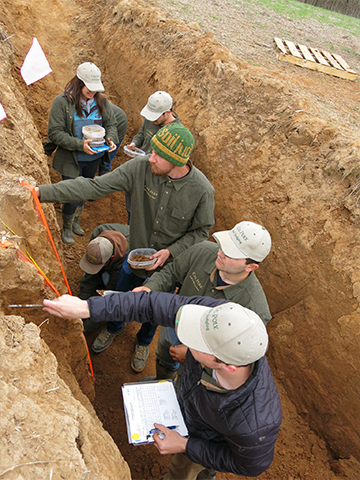 In addition, at the National Collegiate Soils Contest hosted by the University of Tennessee, also held in March, the Cal Poly team placed 12th overall, competing against 22 teams from across the U.S. Povah placed ninth in the individual competition, qualifying him to join the national team. 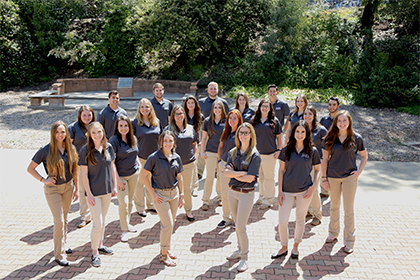 This is the fi rst time a Cal Poly student will compete at the international contest. Seven students were on the team this year: Povah; environmental management and protection senior Brian Clark; environmental earth and soil sciences senior Jaclyn Supkoff; environmental earth and soil sciences senior James Smith; environmental earth and soil sciences senior Ryan Cunning; environmental earth and soil sciences senior Taylor Wigglesworth; and wine and viticulture senior Kyle Angelich.